Our 8" x 8" Base Unit provides a solid foundation. Its welded steel contruction can feed up to four additives using one base unit. Lexan® windows come standard but an optional clean-out window is available. 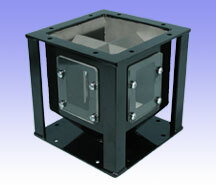 In addition, we offer a No Leak Base Unit Slide Assembly.